A terrific Asian noodle dish for the family. Toss with sesame oil; keep warm. Heat oil in wok or large skillet; add beef. Stir-fry 2 to 3 minutes until browned; remove. Keep warm. Add broccoli; stir-fry until crisp-tender about 3 minutes. Add red pepper and garlic; stir-fry 1 minute. Stir in sauce and beef; cook until heated through. Serve over noodles; sprinkle with sesame seed. 152 members have added this recipe to their cookbook. Not for phase one. I used zucchini strips boiled in non fat chicken or beef broth. Not sure - WOuld be better if noodles are specified as whole grain in some way. A traditional Japanese dish of soba noodles tossed with chicken, and covered in teriyaki sauce. 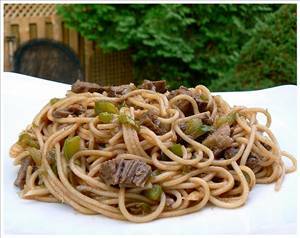 There are 473 calories in 1 serving of Beef, Broccoli and Chinese Noodles. Calorie break-down: 30% fat, 46% carbs, 24% protein.